1.) Greatly increased rates of mutagenesis clastogenesis and chaotic recombinagenesis resulting in ongoing nDNA genomic instability including point mutations, insertions, deletions, duplications, inversions, translocations, gene fusions and conversions. 2. Chronic global hypomethylation caused by shunting of folate away from S-adenosylmethionine (SAMe) biosynthesis by excess TYMS expression. Ongoing biosynthesis of the angiogenic factors deoxyribose (dR) and deoxyribose-1-phosphate (dR-1-P) by catalysis of excess intracellular pools of dUMP (switch low) or dTMP (switch high). 3.) A shift from oxidative phosphorylation (OXPHOS) to glycolysis (the Warburg effect) caused by ongoing genetic damage to both mtDNA and nDNA. 4.) Generation of tumorigenic exosomes encoding TYMS on extrachromosomal elements including circles or palindromic hairpins. 5.) Ongoing telomere shortening generating cell lineages with altered chromosome number (aneuploidy). 6.) Continuous formation of regions of cell lethality (apoptosis/necrosis) within the tumor cell mass due to low TYMS expression. 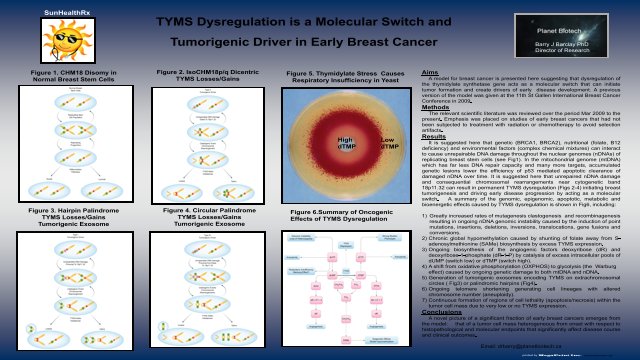 Summary: A novel picture of early breast cancers emerges from the model presented here, that of a tumor cell mass heterogeneous from onset with respect to histopathological and molecular endpoints due to TYMS dysregulation that significantly affect disease course and clinical outcomes. 1.) Disruptive environmental chemicals and cellular mechanisms that confer resistance to cell death. Narayanan KB, Ali M, Barclay BJ, et al Carcinogenesis. 2015 Jun;36 Suppl 1: S89-110. doi: 10.1093/carcin/bgv032. Review. 2.) Assessing the carcinogenic potential of low-dose exposures to chemical mixtures in the environment: the challenge ahead. Goodson WH 3rd, Lowe L, Carpenter DO, Gilbertson M, Manaf Ali A, Lopez de Cerain Salsamendi A, Lasfar A, Carnero A, Azqueta A, Amedei A, Charles AK, Collins AR, Ward A, Salzberg AC, Colacci A, Olsen AK, Berg A, Barclay BJ, et al Carcinogenesis. 2015 Jun;36 Suppl 1:S254-96. Doi: 10.1093/carcin/bgv039. Review.